You can vary this recipe to suit your tastes, serving the gremolata with fish, beef or lamb, for a bright herbal accent. Substitute arugula or cilantro for the parsley, or add a pinch of red pepper flakes for spice. Orange or grapefruit zest are delicious instead of lemon as well. Serves 4. Prep time 25 minutes. For the gremolata, this recipe makes about ¼ cup, and it can be made a day ahead and refrigerated, tightly covered, until you are ready to use it. Use a micro plane or the fine side of a grater to shred the zest from the lemon onto one side of the cutting board. Halve the rest of the lemon, and set aside. On the other side of the cutting board, mince the parsley finely. Chop the garlic finely, then combine the zest, parsley and garlic on the board and chop together to a fine mince. Transfer the parsley mixture to a small bowl or cup and drizzle 2 teaspoons of olive oil and a pinch of salt over the mixture, stir to mix well. If the mixture seems dry, add more olive oil to taste. Place the chicken on a cutting board, drizzle with olive oil and rub to coat, then sprinkle with salt and pepper. Preheat a grill pan over medium-high heat until very hot. Place the chicken on the grill pan and let cook, undisturbed, for about 5-6 minutes. Carefully turn each breast and squeeze a little lemon juice over the top. Continue cooking for another 5-6 minutes, or until the chicken is firm to the touch and an instant-read thermometer inserted in the thick part of the meat registers 165 degrees F.
Let the meat stand for a couple of minutes before serving. 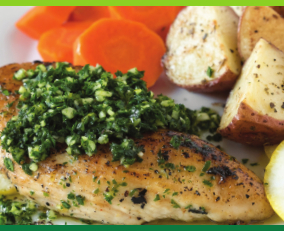 Sprinkle about a tablespoon of gremolata over each chicken breast.